Scott Parsons' printmaking class was a bit different on Thursday. For starters, it was held outside. And there was a steamroller involved. 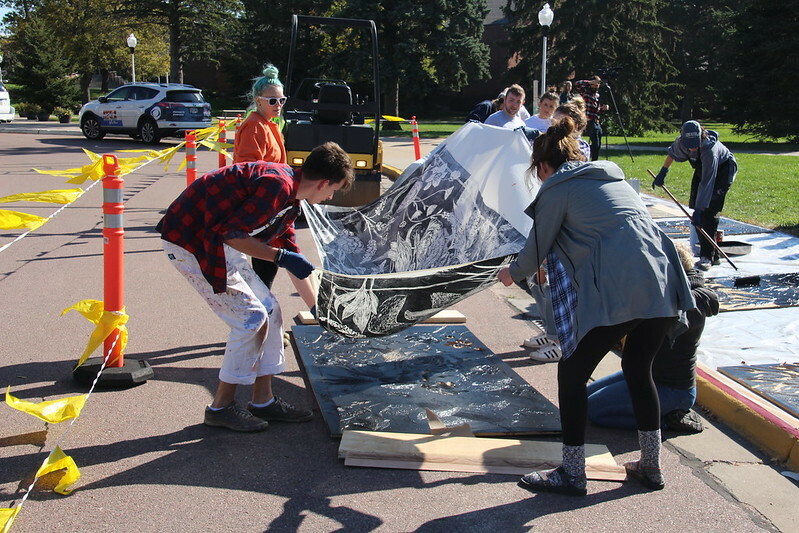 For the first time ever, the Art Department collaborated with Myrl & Roy’s Paving in Sioux Falls to create approximately 50 large-scale prints in five hours on Augustana’s campus. The project took place on Commons Circle Drive, near the Center for Visual Arts and Morrison Commons. The idea for the project came after Parsons, who teaches printmaking, was inspired by seeing Albrecht Dürer’s large print “Triumphal Arch” (from 1515–17) while in Germany. From there, he asked his students to team up to carve large 4 x 8 ft. blocks of medium-density fiberboard (MDF), boards essentially made from sawdust and glue, which were then cut by students using traditional hand-carved relief printmaking tools, Dremel tools and electric routers. What was left of the original surface was then inked and printed by running over the print with a steamroller. Previously, Augustana printmaking students worked with students from Iowa State University in Ames, Iowa, to steamroll prints. When the company that provided the steamroller was sold, Professor Parsons found a willing partner locally with Myrl & Roy’s Paving. “We’re so excited to bring this event to Sioux Falls for the first time,” Parsons said. Two students from Iowa State also brought their own carved boards to print with the Augustana students. The subjects in the students’ prints include Nordic mythology, medieval astrology, prairie flowers, Alice in Wonderland, and tourists.